As per reports, a Dalit boy named Pramod son of Jaini Prasad, had gone to bring a bucket of water from a nearby RO plant around 8 pm on Sunday. When he was returning, two Muslim boys identified as Shahrukh and Salman allegedly made Pramod trip and fall down which led to a confrontation between them. As per reports, when Pramod reached with his family members to confront Salman and Shahrukh, men named Yusuf, Akram and others had already gathered more than a hundred of their supporters. 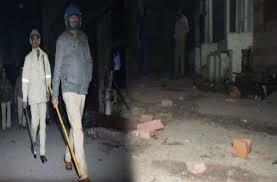 The violent mob then proceeded to attack the houses of the Dalit community in the area. Communal tension erupted in Teela Nandram of Mantola area in Agra on Sunday night after violent clashes took place between the Dalit and the Muslim communities.